BRIAN WILLIAMS, anchor: Tonight, from New York west to Chicago and St. Louis and beyond, members of the protest movement that started under the banner Occupy Wall Street are on the move. This is the two-month anniversary of the birth of the movement, and this was billed as a day of action. It started in New York with thousands on the move and police right behind them. We begin with this still unfolding story tonight. NBC 's Mike Taibbi in Lower Manhattan . Hey, Mike , good evening. MIKE TAIBBI reporting: Good evening, Brian . You know, the Occupy Wall Street movement had promised huge crowds for its day of action, and that prediction finally looked realistic a short time ago. Now, some 5,000 protesters, union members and supporters are gathered in Foley Square , that's near New York City Hall and all the city's federal buildings. Before that, much smaller crowds and the police in complete control even when tempers flared. There were confrontations that resulted in injuries and scores of arrests in Lower Manhattan . The police from daybreak on keeping protesters on the sidewalks, out of the streets and away from announced or expected targets like the New York Stock Exchange . Crowd: NYPD blue, they will take your pension, too. TAIBBI: Protest spokesmen had said that at the very least they would disrupt or delay the opening bell. Unidentified Man #1: We're frustrated, we're angry and they can't just go about business as usual. TAIBBI: But the bell did ring on time and as usual, and in the streets outside it was clear even some supporters were losing patience with the drawn out Occupy phenomenon and its impact on the neighborhood. Unidentified Man #2: Yeah, I was supposed to be to work at 8:30, and it's taken me over an hour. TAIBBI: Others aimed derisive signs at the protesters, or simply shouted. Unidentified Man #3: Go out and get a job. TAIBBI: Overnight Occupy movement tent cities were dismantled in Dallas and in Berkeley . Unidentified Man #4: Every time we set up, the police are going to trample on our First Amendment rights , and we're going to come back and say we're not going to have rights abridged. Unidentified Man #5: We need good jobs, not cuts. TAIBBI: ...in Los Angeles , Albany and Las Vegas . Unidentified Man #6: We' want to send a message to the 1 percent that the 99 percent aren't going to take it anymore. Unidentified Man #7: What's the solution? TAIBBI: But they've been saying the same thing for two months. And without a list of demands or a concrete plan, how much support does the movement have now? Unidentified Man #8: We want to stimulate the economy. We want these people out of our parks and our city. The fight is in the wrong place. TAIBBI: And so far there've been about 200 arrests and there will be more if the protesters who amassed outside the Brooklyn Bridge on the Manhattan side try to cross that bridge and disrupt rush hour. So far that hasn't happened. Brian: Mike Taibbi in a wild night in Lower Manhattan . Mike , thanks. 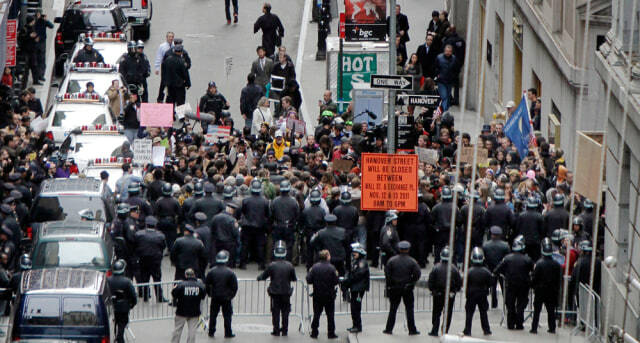 New York City Police officers prevent protesters from entering Wall Street from the east on Thursday. Demonstrators marched through New York's financial district and promised a national day of action with mass gatherings in other cities.